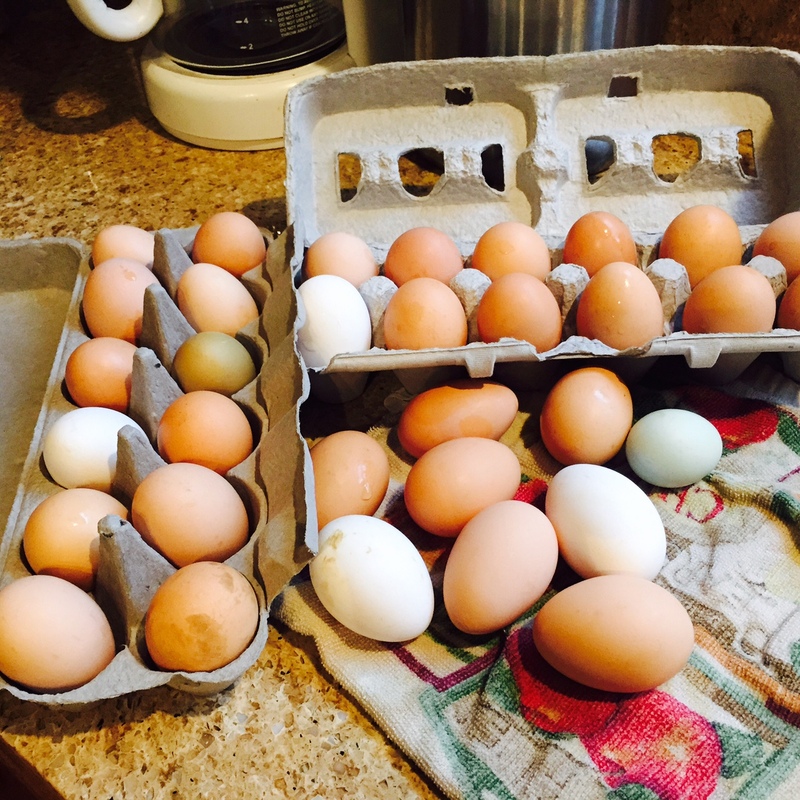 This will be the last week I get home-grown eggs for a long time, unless they are a gift. The chickens are going to the auction tomorrow. So, I plan to wash the large bowl that was collected, the few that will be in the barn in the morning, and maybe collect an occasional egg from the 3 escapees that Rob could not catch. He may catch them in the morning, though. The eggs I get will store well, I will use them, and then begin buying eggs again. We usually have scrambled eggs for breakfast several times each week, and sometimes do them easy over or in omelets. We still will, but not quite as often, as eggs are expensive around here. If they come down in price for Easter, I will get several cartons. Last week, I was glad to have the menu. I did not stick to it all the time, but it was good to refer to whenever I was at a loss. I ended up staying home all day Friday and Saturday, sorting, pre-packing, organizing the camper, and cleaning. We had help both outside and in. I fed quite a few extras this week, and was glad for their presence. I pulled a frozen casserole out on Saturday and it was slicked up quickly! This coming up week is one of the busiest yet. There will be many extra people to feed. I love doing it, I just need a good plan that does not involve a crock pot that doesn’t cook the food by mealtime! Sunday: We ate at my sister’s house and she and my aunt provided it all. Rob and I cooked a lot of the food, following their instructions. She made a crock pot full of assorted meat (pork chops and a very small ham). I made about 6-7 lbs. of mashed potatoes from the bag my aunt left on the counter. Rob made gravy from the juices in the bottom of the crock pot. I cooked a pot of home-canned beans and my aunt made salad. It was great. We only had 14 today, so it was just the right amount of food. Our other sister, Rosalie, surprised us by joining us for the meal. I knew she might come, but Gail did not, so was super surprised and happy to see her. Friday: 4H day. 20+ kids, plus parents, doing classes all day. We will eat the food for lunch and dinner will be leftovers or hot dogs. Saturday: At the last count, I’m thinking 10+ for the noon meal. I think I will get ricotta cheese and make lasagna. I have the rest of the ingredients and it could just be popped in the oven on such a busy day. I will also make a large salad and some dessert of some kind. I may do carrots and celery and some ranch dip. Sunday: There are between 20-30 people coming to help at last count. They are bringing soup and bread. I will finalize details on Tuesday, but I will probably make another crock pot of soup. I plan to do a moving update post and will explain more fully on there. Awe. So sad for the chickens. I was thinking about getting one as a pet to run around my little yard. Wish I was close, I’d buy one off you. I am sad about it. I love those home-grown, fresh eggs. But, chickens are pretty easy to replace, and even people in town have them frequently around here. It’s just going to make our lives easier without livestock right now when things are so chaotic.